In 2010, Honolulu banned consumer fireworks (including relatively harmless sparklers and paperless firecrackers), shark fin soup, and gas-powered leaf blowers (electric leaf blowers are okay, but only between 7 am and 7 pm); Maui and Kauai banned plastic bags (Hawaii, Honolulu, and the Big Island attempted it). In 2009, Honolulu and the Big Island banned driving while talking on a cell phone or texting; Hawaii attempted to ban pocket knives; Honolulu attempted to ban pit bulls and even the Wienermobile (citing the 1927 billboard ban). In 2008, Maui and the Big Island banned plastic bags; and Hawaii banned the genetic modification of taro for five years. In 2006, Hawaii banned smoking in public places such as restaurants and malls. Since 2001, carry-on water bottles, baby formula bottles, pocket knives, and even snow globes have been banned in airplanes. In 2000, Hawaii banned shark finning. Across the country, states believe they know better than we do and are trying to take control of our lives – by banning Happy Meal toys, trans-fat, soda, snacks, books… Is this the path to the world of “Demolition Man”? Is it just me, or are state and federal governments banning more and more things from our lives? They seem to think we can’t be trusted. But do you trust government more than yourself? I have an idea: Let’s ban government bans. Most products and behaviors can be regulated, not banned outright. Government should not have that much power. We need to take responsibility for our lives. What do you think? When I was growing up, we didn’t talk about money. I learned about it in school – I had a great teacher in the fifth grade, Ms. Foster, who was the banker and “employer” for our class. But my parents didn’t do family budgets or talk about how much money they made. It was all a little secretive. I’m not a money expert, but here are some easy ideas to help teach your children about managing money. As soon as children can count, you can start teaching them about working hard and spending wisely. * Start not one, but three money jars. 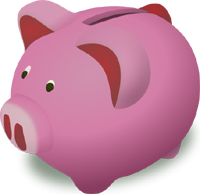 Loose change, allowances, and gifts can be set aside in three ways: to spend, to save, and to share. * Create birthday and holiday “wish lists” on the refrigerator or a white board. Kids can cut out pictures of or write down the top three toys they want, and change the list (or the order) as the weeks go by. If the toys are still on the wish list, week after week, then it’s something they really want. * Open a family bank and let kids design their own money. They can earn money by doing homework and chores, and spend it on small treats or special time with parents. * Let them help with the family budget. Show them how much you spend on rent/mortgage, utilities, gasoline, food, clothes, entertainment, and other expenses. It will help them put their spending into perspective, and may help you re-examine your own spending. * When teens get their first job, remind them to “pay yourself first” – by putting money into a savings account before they start spending it. Automatic deposits are a great way to do this without having to think about it, and is the start of a great habit. * Open a joint credit card with your teen. You can talk about spending habits, budgets, and interest rates. It will also help build your teen’s credit history. What are your tips for teaching kids about money? What do you wish your parents had taught you? About once a year, I reluctantly sit down and figure out how much I spend each month. I write down the critical expenses: groceries, rent/mortgage, utilities, taxes, medical, insurance, education, gifts, and entertainment. I come up with the amount I need just to get by, without vacations or splurging on big-ticket items. Unlike the government, I don’t automatically assume that I can spend more than I did the previous year. But that’s just the assumption that government makes. In the end, it’s not about choosing between spending cuts and higher taxes. It’s about creating a realistic budget for our government. That’s where a zero based budget (ZBB) can be a great tool. I first learned about ZBB from Martin L. Gross’ “The Government Racket: Washington Waste from A to Z” (1992). It was written almost twenty years ago, but it’s still relevant for today. According to Gross, a zero based budget “starts from scratch, as if there were no government, then develops a budget for what is necessary to run the operation” (page 19). I’d like to propose a special budget commission to figure out exactly how much money we need to run Hawaii’s government. It could include business executives, community leaders, accountants, and engineering experts. Everything else would be prioritized. It won’t be easy, but I think we need to evaluate everything that government does and consolidate government programs. What do you think – can we start at zero and build a lean government that does a few things well? Happy New Year from the Better Hawaii Blog! You’re probably tired of making New Year’s resolutions, so let’s skip the resolutions this year. Instead, let’s take small steps to make ourselves – and Hawaii – a little better. Small changes for all of us: * Compliment someone every day. * Take a walk in your neighborhood once a week. * Make eye-contact and say “thank you” to cashiers and wait staff. * Eat on a smaller plate. * Drink more water. * Walk up a flight of stairs. Small changes for parents: * Leave the stroller at home. * Turn off the TV, phone, and electronics one night a week. * Read to your child every day. * Teach your kids about money, credit cards, and interest rates. * Take 5 minutes to look over your child’s homework. Change starts with you. What small steps can you take today? 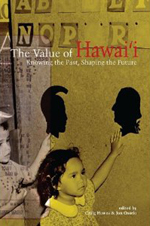 “The Value of Hawaii: Knowing the Past, Shaping the Future” (2010) edited by Craig Howes and Jonathan Osorio is a collection of 28 essays focusing on what is valuable about Hawaii to us. The book is not a repair manual or a shared manifesto, Howes cautions. “These essays encourage the entire community to enter into discussions about Hawaii’s future” (page 4). Howes identifies three themes throughout the book: 1) We must come fully to terms with Hawaiian claims to land and sovereignty; 2) We require a certain number of government services and planning to preserve our society and environment; and 3) Government and private-sector partnerships are essential. While I am disappointed that there is only one perspective on each issue, the editors have done an amazing job of gathering short, general essays from a wide variety of writers, who offer us a historical perspective and recommendations for our future. * Agriculture: Charles Reppun (Hawaii farmer) writes a thought-provoking essay about food self-sufficiency, warning that “If the world is made of up many ‘islands,’ each ‘island’ is in trouble when the food production and distribution systems they rely on are unsustainable” (page 45). He offers us a starting point with school, backyard, and community gardens; building permits requiring garden spaces; and historic Hawaiian fishponds restoration. * Government: Chad Blair (reporter, author, and educator) proposes specific and reasonable ways to streamline government, such as a unicameral assembly, term-limits, nonpartisan elections, and an end to nonbinding resolutions; and states that “Political parties can’t solve Hawaii’s problems. It takes hard work, respectful argument, and ultimately, compromise” (page 82). * Education: Mari Matsuda (author and educator) tells us that standardized tests, blaming teachers and unions, and restructuring doesn’t improve public education; asserts that “In the good school, the students, the teachers, and the parents own the school” (page 97); and offers 10 suggestions to save public schools, such as raising teacher salaries, ending unfunded mandates, introducing wrap-around social services, and measuring success by more than just test scores. * Energy: Henry Curtis (Executive Director of Life of the Land) writes an informative introductory essay about seven possible paths towards energy independence: Macro/interisland grid, biofuel, ocean, battery, Micro/small grids, high tech, and energy efficiency; and declares that “Hawaii has every natural resource to create our own energy, and an abundance of human resources and technological know-how to design innovative systems” (page 186). * Hawaiian Sustainability: Davianna Pomaikai McGregor (professor and historian) discusses cultural kipuka (rural communities largely untouched by Western society); emphasizes that “A sense of community and the sharing of resources and responsibilities for childrearing and kupuna care are parts of the lifestyle valued by longtime residents of cultural kipuka” (page 210); and encourages us to renew our ties to the past, such as respecting place names, creating cultural area reserves, and creating community-based subsistence fishing management areas. I hope that you will read this book and think about the challenges facing Hawaii today – and tomorrow. What can we do to uphold and protect what we value about Hawaii? You are currently browsing the Better Hawaii weblog archives for January 2011.